Hi everyone and welcome! Just giving you a quick heads up that I'm sharing the first of a few cards made with Carabelle Studio designs over on the Frilly and Funkie challenge blog as part of a Friday Focus. Hope you can join me over there to see this one in full and a further two more besides. Hi everyone and welcome. I'm back for my second post of the day with a new project for Eileen Hull Designs. The Inspiration Team were challenged with the idea of creating projects for the various seasonal holidays taking place for the next couple of months. Now here in the UK we don't celebrate Thanksgiving but I love the colours we associate with this time of year and the idea of throwing a get together party. So here's a planner that is perfect for recording all those important details in the run up to the event and memories from the day itself. The basis of this little book is the Passport die which cuts, scores and hole punches not only the covers and spine but also the pages inside. I used Dina Wakley paints to colour the cover, using Eileen's some of Stitchy Flowers dies to create stencils and more stencils from Seth Apter/Stencil Girl Products (the dots on Alpha Drips and Number Drips). The title and little flower came from Eileen's upcoming Floral Arch and Words set and the little acorns from an older Tim Holtz Decorative Strip Die. Imagine my delight to discover a stash of old Kay & Co scrapbook papers when digging for something in the bottom of a cupboard, one of which matched the cover of this little notebook perfectly! Serendipity for sure. I used a sheet of it to cover the outside of two handmade books and frame the Bookplate at the front. You'll spot another of those Stitchy Flowers adorning it. The books are perfect for recording guest lists, menus, seating plans and so on. I included tabs from the ever popular Journal die throughout each book for ease of reference, each covered in more of that paper. Towards the back are two small plastic wallets which hold coordinating double-sided photo mats, ideal for adding memories of the day and turning a planner into a record of the event. All of these elements can easily be slipped in and out of the elastic ties. Finally at the back of the book is a little ruled notepad complete with pencil. I took an idea from Anne Redfern and used Sizzix Paper Leather covered in the coordinating paper to create a pencil holder as that stuff is so incredibly durable. So that's it for the second little book of the day (you can find the first one HERE). My talented colleagues from Eileen's Inspiration Team have produced lots more holiday projects for you to enjoy - make sure you hop on over to Eileen's website to see them. Hi everyone and welcome! Sara Emily's hosts the latest challenge over on the Frilly and Funkie Challenge blog. She's called it 'Tis Near Halloween' and here's her description for the challenge requirements; "It's no secret. I. Love.Halloween. With Halloween just a few weeks away, I challenge you to create a vintage or shabby chic project with a Halloween theme. If Halloween isn't your thing, that's OK - just be sure to include orange, black and purple in your vintage or shabby chic project (These colors are not required if your theme is Halloween.) It would be a grave mistake to miss this challenge!" My spooky project for the challenge is this hand-stitched notebook - the perfect place for recording potions and more. The pages inside were created using a mix of white card and Tim Holtz 'Memoranda' Paper Stash, embellished with his Halloween Ephemera, Clippings stickers, machine stitching and stamping using Tim's 'Laboratorie' stamp set (I've only shown some of the pages in the video below as there were 72 pages in all!) Tuck spots were also added to some of the patterned pages. The front cover was made from one of Tim's Halloween Baseboards with some additional Ephemera. The back cover was created using a carrier sheet for one of Tim's large stencils added to a piece of chipboard 4"x 6" and I painted the inside of each cover with black gesso to coordinate. Finally the whole book was bound using coptic stitching to allow it to open flat on each page. See some of the pages in the following video - you can expand the screen using the icon in the lower right corner to get a closer look). I'm very pleased to report the person this notebook was designed for was thrilled to bits with it. So for now that's my DT project for the current Frilly and Funkie challenge 'Tis Near Halloween'. Make sure you hop on over to see what my talented team mates have been inspired to create for this challenge, and remember to link your own shabby chic or vintage projects featuring rust to be in with a chance of winning one of the fabulous prizes that are up for grabs. Hi everyone and welcome! For the past week it's been Autumn Clark's turn to host the latest challenge over on the Frilly and Funkie Challenge blog. She's called it 'Show Us Your Stamps' and here's what she is asking for with this one; "Our challenge this round can be summed up with one word - STAMPS! We want to see you break out those stamps and get inky. There are so many ways to use stamps, and you probably have a few you have never even used - so come play along! We cannot wait to see your stamped vintage or shabby chic creations." 1. Cut a piece of Ranger Watercolor Paper 4 1/2" x 5 1/4". Dip into Frayed Burlap Distress Oxide Ink mixed with a little water and dry. Repeat to mop up some of the remaining ink. Add water droplets using a Tim Holtz Distress Sprayer and blot to remove some of the ink. 2. 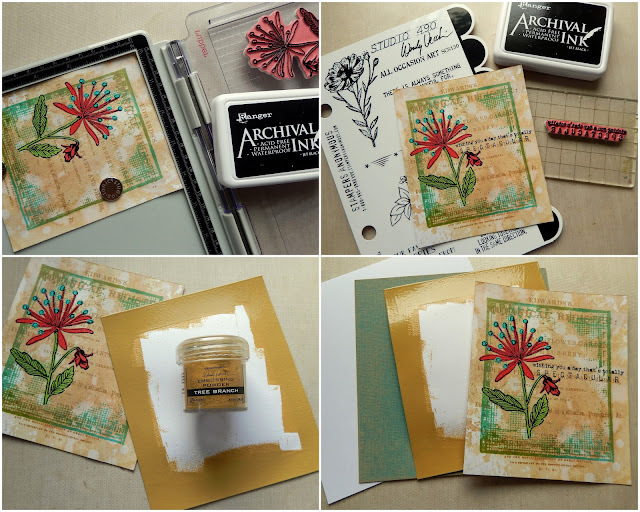 Use the Tim Holtz Stamp Platform to stamp Wendy Vecchi's Botanical Register Background Stamp onto the centre of the inky paper with Tree Branch Archival Ink. You may need to repeat this process to ensure the image is clear and crisp. 3. Again using the Stamp Platform, this time with a combination of Garden Patina and Leaf Green Archival Inks, stamp Wendy Vecchi's Rectangle Collage Background Stamp onto the centre of the paper. If the first impression isn't to your liking it's easy to repeat the process. 4. This time use the Stamp Platform with Wendy's Stamp It Stencil It! Prairie Flower set to add a Jet Black Archival Ink flower on one side of the paper. Remove the paper from the Stamp Platform ready for the next stage BUT leave the flower stamp in place as you'll be over-stamping the image later. 5. Use the Ranger Emboss It Dabber to apply embossing ink through the leaf section of the stencil from the Stamp It Stencil It! set. 6. Using the end of a palette knife, a small spoon or similar, add a little Carnation Red Wendy Vecchi Embossing Powder onto the flower bud part and tap off any excess. 7. Cover the remainder of the embossed section with Leaf Green Wendy Vecchi Embossing Powder, again tapping off any excess. Use the Ranger Heat It Craft Tool to melt/heat set the powder. 8. Now apply more embossing ink through the flower section of the stencil and cover in more Carnation Red Wendy Vecchi Embossing Powder, heat setting as before. 9. 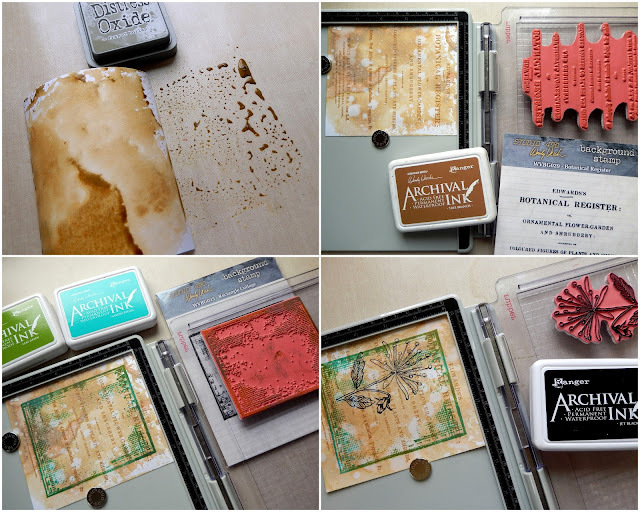 Finally apply embossing ink through the dot section of the stencil and cover in Garden Patina Wendy Vecchi Embossing Powder, heat setting as before. 10. Return the paper to the Stamp Tool, positioning it in exactly the same place as before, and over-stamp the flower using Jet Black Archival Ink to reveal all the details. 11. Stamp the sentiment from Wendy Vecchi's All Occasion Art stamp set in Jet Black Archival Ink onto the paper either using the Stamp Platform or an acrylic stamping block. 12. Cut a piece of card 4 3/4" x 5 1/2" and add the embossing ink to the edges of it. Cover the ink with Tree Branch Wendy Vecchi Embossing Powder and heat set as before. 13. To finish layer up the stamped paper onto the embossed card, a coordinating piece of Tim Holtz Ideaology Classic Kraft Stock (cut to 5 3/4" square and sanded to reveal the kraft core) and finally onto a 6" square white card black. I added some machine stitching detail but it is not essential. For the second version I followed the same steps, replacing the Leaf Green and Garden Patina Archival Inks with Carnation Red and Cactus Flower Archival Inks on the Rectangle Collage Background Stamp. 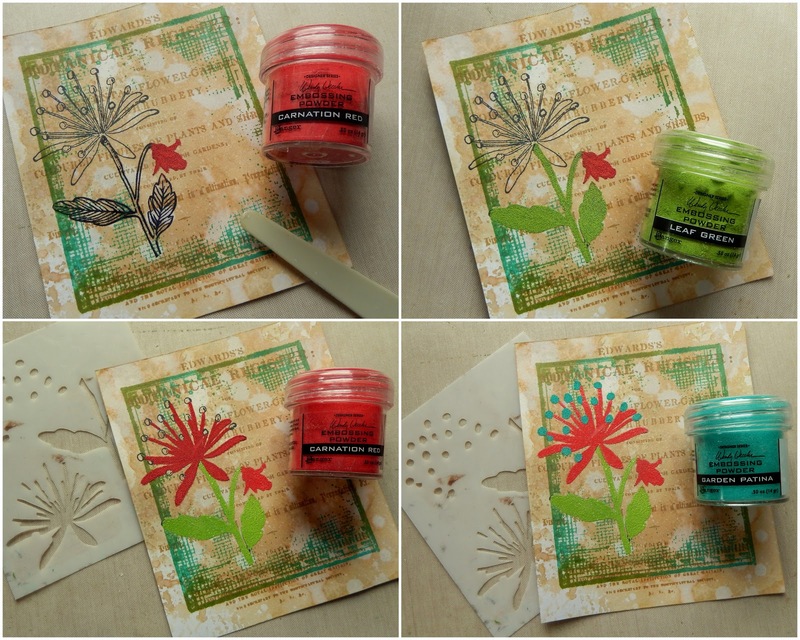 I also replaced the Garden Patina Embossing Powder with the Cactus Flower Embossing Powder when colouring the flower. That's it for my DT project for the current Frilly and Funkie challenge 'Show Us Your Stamps'. I hope you've enjoyed seeing the tutorial - if you have any questions be sure to leave a comment below. Meantime do make sure you hop on over to see what my talented team mates have been inspired to create for this challenge, and remember to link your own shabby chic or vintage projects featuring stamping to be in with a chance of winning one of the fabulous prizes that are up for grabs. I'm off to get in some more playtime with these gorgeous embossing powders.